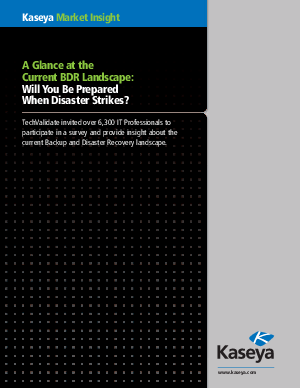 > Kaseya > A Glance at the Current BDR Landscape: Will You Be Prepared When Disaster Strikes? As businesses struggle to establish a better approach to data management, the current landscape for data backup and disaster recovery continues to see rapid evolution. This, primarily a result of major trends such as Virtualization, Big Data and calls for automated data management all of which continue to drive demand for change. This progressive landscape leaves many IT professionals pondering what solutions will stand-up to today’s environment while also being able to adapt to meet next generation challenges. Providing some insight on this subject, a recent TechValidate study asked IT professionals about their BDR preparedness and the trends, challenges and pressing needs that affect them most -- some of the results may surprise you.